The role of calcium phosphate in cementing together the casein micelle is well known and it is unsurprising that calcium salts also play a major role in modulating cheese texture. The most dramatic example of the importance of calcium to cheese texture occurs in Camembert cheese. The white mould, Penicillium camemberti, grows on lactic acid on the outside of the cheese, thus deacidifying the cheese surface. The pH of the cheese surface increases from perhaps 4.6 immediately after manufacture to well above pH 7 and a pH gradient develops from the centre towards the outside of the cheese. The calcium phosphate precipitates at the high pH and more then migrates from the centre of the cheese towards its surface to maintain equilibrium by replacing the calcium phosphate "lost" on precipitation. 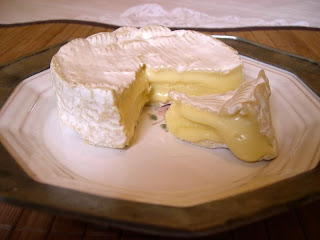 The combination of increased pH and loss of calcium cause the characteristic softening of Camembert. Indeed, this variety can almost become liquid as ripening progresses. However, the role of calcium in cheese texture is not restricted to varieties such as Camembert and Brie. The pH at whey drainage largely determines the calcium level of the curd. For example in Swiss cheese, the high pH at whey drainage means little casein-bound calcium phosphate dissolves and is lost in the whey. Thus, the curd retains a high calcium level and is relatively elastic compared to varieties in which significant acid develops before whey drainage. An equilibrium exists within cheese also between casein-bound calcium phosphate and calcium salts in solution in its aqueous phase. Solubilization of casein-bound calcium occurs during the early stages of Cheddar cheese ripening and this has been correlated with the initial softening that characterises this variety in the first month of ripening and with the rheological properties of Cheddar cheese. O’Mahony, J.A., P.L.H. McSweeney, J.A. Lucey (2005). A model system for studying the effects of colloidal calcium phosphate concentration on the rheological properties of Cheddar cheese. Journal of Dairy Science 89, 892-904.